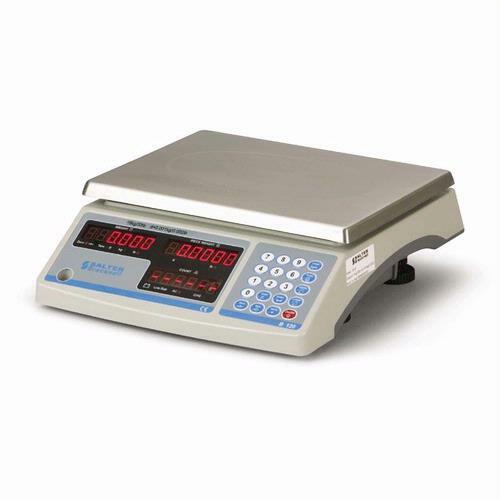 The Salter Brecknell B120 is an economical counting scale you can depend on for a variety of office and light industrial use. Intuitive keystrokes and an easy to operate design allows for quick operator training, and a variety of functionality. The B120 is an economical counting scale you can depend on for a variety of office and light industrial use. Intuitive keystrokes and an easy to operate design allows for quick operator training, and a variety of functionality. The unique features of the B120 includes; keyboard piece weight entry, “Count Check”, which allows you verify package counts when configuring upper and lower limits or “Accumulation” allowing you to accumulate the piece counts for simple packing or receiving verification. Additional features include a configurable “Auto off” setting and power switch to increase performance of battery life, simple field calibration using weights between 25%-100% of the scales capacity and piece weight memory allowing you to count identical items without having to obtain a new sample piece weight. Also includes LED’s to indicate status of low battery, AC power and charging of the battery. Tare– Used to zero off (up to 100% of capacity) an empty container or weight, not required in the calculation of an average piece weight. Use of tare will reduce the scales maximum weight capacity by value stored.